GCI is inspecting single family homes that were damaged by Hurricane Michael. GCI wanted to “pay it forward” and “give back” to someone in need and selected Stephanie. Her military service was not the deciding factor, but it was a bonus to help a service member. 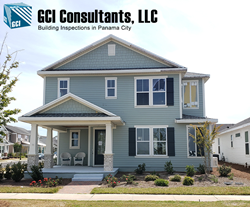 GCI Consultants, LLC., a building envelope consulting firm with expertise in Hurricane Damage Inspections has a team of building inspectors that is inspecting thousands of damaged buildings in the Florida panhandle following Hurricane Michael devastating the area last October 2018. While many volunteers and organizations have left; GCI is there to stay until they can no longer help. GCI recently posted an article on their Facebook page stating “It's hard to find the words to describe the impact that Hurricane Michael has had on the folks living in the panhandle area. Our hearts go out to those who have suffered great loss and who's lives will forever be changed by this storm. GCI wants them to know that they are not forgotten. We will continue to do our part in the process of rebuilding. Months later; we can still find obvious signs of destruction everywhere. We have observed broken trees, foundations of homes that were swept away, buildings without a roof, damaged roofs, broken & empty windows, plywood where windows and doors used to be, debris and even a tricycle sitting on the ground without a clear path for the child to ride it. It is absolutely surreal. Unless you have visited this place; you cannot get a feel for the situation that will take much time to recover from.”. GCI has volunteered to help a young lady (Stephanie St. Pierre) who happens to be on active duty in Maryland with the armed forces. Her home has suffered damages while she was away serving our country. She contacted GCI for help with providing a report to document window damages. GCI will be performing this task pro bono and will connect her with a Public Insurance Adjuster who will take GCI’s forensic report to the insurance company in order to get her claim honored and home back to pre-storm conditions. GCI wanted to “pay it forward” and “give back” to someone in need and selected her. Her military service was not the deciding factor, but it was a bonus to help a service member. GCI’s specialized niche for hurricane damage inspections is to inspect windows & doors in all sizes of buildings from single family residences up to high rise towers and assemble a report detailing damages that can be used with the insurance claim process.